Greentooth was a warrior of DarkClan. He was strong and charges in to battle as soon as the opponent was in view.His mother was Darkflower. His sisters are Blueeye and Purpleclaw. His brother is Ambereye. He had poisonous teeth. He never really talked but when he did, it wasn't nice. He has a apprentice like Ambereye, but it is Darkfur..
Purpleclaw is a cat of darkness, and an old DarkClan warrior. She is a black she cat with a bit of white and purple eyes. She was the fastest of the four cats and she could slink into the shadows and would be on the other side on the battle field in seconds. Her mother was Darkflower. She and her littler mates where banished after killing the medicine cat Cindernose. Her brothers are Greentooth and Ambereye. Her sister is Blueeye and her apprentice is Darkfang. Blueeye is a cat of darkness and an old DarkClan warrior. She is a black she-cat with a white muzzle. Un-like her litter mates, her power was to heal, not kill. She was the mind behind the killing and is one of the worst of the cats of darkness. She only heals her litter mates and any one who comes in her way will be killed. One way or the other. She was banished like the rest of them and her mother is Darkflower. Her sister is Purpleclaw and her brothers are Ambereye and Greentooth. Her apprentice is Nightfur. Her and her littermates where some of the first DarkClan warriors. 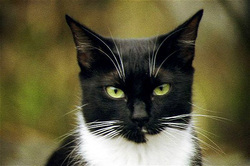 __Lavaheart is a newly found 5th cat of darkness, not by being a founder but by being so powerful. She was born evil to the core. she is the definition of the Silent forest. she can spit out short bursts' of fire at will, after killing whitestar's parents when he was a kit in Iceclan, she took him to a twoleg house. after many moons, they all forgot about the lost kit. little did they know that kit would soon be the leader of Darkclan. she has killed countless cats, mostly kittypets, she did just for joy. Clawpelt is to take her place if she is killed(turns to dust in battle) or eventually fades away. 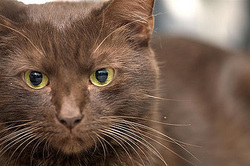 Birdstar is a brown shecat with green eyes. She was a leader in MoonClan but wasn't mentaly stable. shes in the Silent Forest because she lost her way when she died. she blocked out starclan and is an expert at it, wich is the only reason the other cats keep her around. starclan can hardly see her, but shes so noisy it doesnt matter anyway. _ Bluebird is a blue she-cat with blazing green eyes. She fell in a strange puddle as a kit turning her pelt blue. She joined the silent forest because her clanmates made fun of her and she wanted to teach them a lesson, sadly she was killed by a fox in her early adult hood. 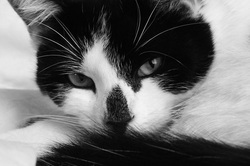 _ Sharpbreeze is a black and white cat. He has always been sort of evil, he never shows weakness and would love to kill anyone who does especially if his own clanmates do, he doesn't believe that a cat who shows weakness deserves to be in a clan, he is one of the fastest cats in the Silent forest. _Dragonfire is an old Dawnclan deputy, and was killed by an apprentice of iceclan. Enraged, he joined the dark forest. Dragonfire still wants revenge upon the small apprentice. after all, Dragonfire was injured when the app. finished him off . Rosetail is a grey she-cat with pink eyes. She was once a warrior of MoonClan, StarClan then said she was to become a medicine cat. Rosetail never really liked being a medicine cat, but she accepted it. Day by day she grew cold and snappy, eventually she killed a IceClan cat in battle. In love with her new pwoer, she diecided to leave her clan, but she was kill before she could by a rogues. _ Treestem was the seventh deputy of Iceclan and was kicked out of the clan for trying to kill his mate after he caught her with another male. after that he became twisted and killed himself by jumping to his death. he joined the dark forest. _Earthquake: He was an apprentice when Scrouge attack with BloodClan. What he saw in Scourage was different, he saw a powerful cat who was stronge enought to rise from nothing, make his own clan and try to take over the forest. Earthquake was going to make his attempt successful; he started at gatherings, finding cats to join his cause. He found many cats to join him, but one night the DawnClan deputy overheard and warned the MoonClan deputy because that's who they were attacking first. One afternoon Earthquake and his group were at Fourstones, about to attack, when a battle patrol from all four Clans attacked them. The clans beat them. Out of 8 lives lost, Earthquake's was one of them. He is now in the Silent Forest. _Knifeclaw: Tom with extremely long knife-like claws. He was born with a medical condition which made him go insane sometimes, but mostly his Clanmates kept him under control. One time in the ancient Skyclan camp, it happened when everyone was sleeping, and he murdered his two sisters and a few other clanmates. He didn't mean to of course, but was banished to the Silent Forest for his crime. In the Silent Forest the land is ruled by the Four Original Cats of Darkness, Ambereye, Greentooth, Blueeye and Purpleclaw. The Silent Forest is divided into five parts; North, South, East, West and Central. Lavaheart and Clawpelt control Central, Needleclaw and Fishface, the North. Dragonfire, Rosetail and Bluebird control the east and Darkthread and Summersun take the South. Finally, Fullmoon and Heartmelt have control over the West. In the end, they all fall under the four cats of Darkness. What is this? A secret cave?! Should you go in, i is risking your life. But.. What is there? Find out by clinking this massage.